These are color-coded file folders that compliment the look and feel of FCPX. They are designed to manage all of your project assets. The folders have preassigned finder tags so they are easy to find, or you can import the finder tags as keyword collections into FCPX. These folders will inspire you to be organized and give you another wow factor for deliverables to your clients. This program was designed because there wasn’t a way to batch export in FCPX - Until now. 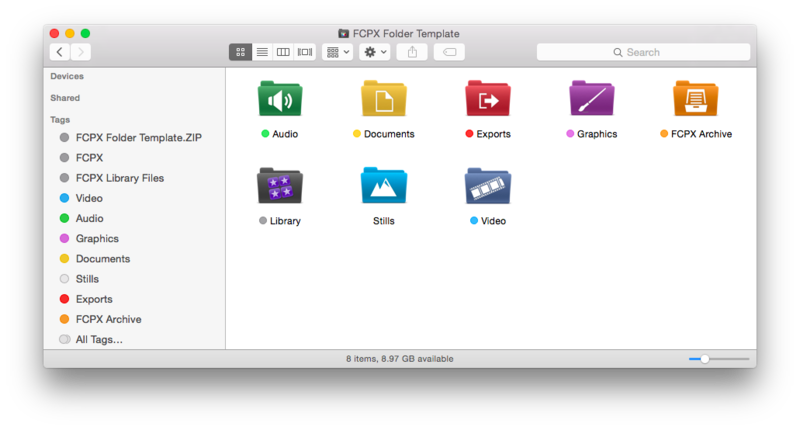 Whether you have 1 or a thousand files to export out of one library, FCPXporter can do the job without you having to sit at your computer and click through each export. If you’re tired of having to be at your desk for each and every file to be manually added, this program will give you the freedom to step away from your desk while FCPXporter does the rest. Give it a try today! We will send you occasional updates about our latest products and deals, but it won't be annoying and you can unsubscribe any time. We won't sell or distribute your info ever, for any reason. We will send you occasional updates about our latest products and deals! Copyright © 2019 FDPtraining.com - All other trademarks and copyrights are the property of their respective owners.